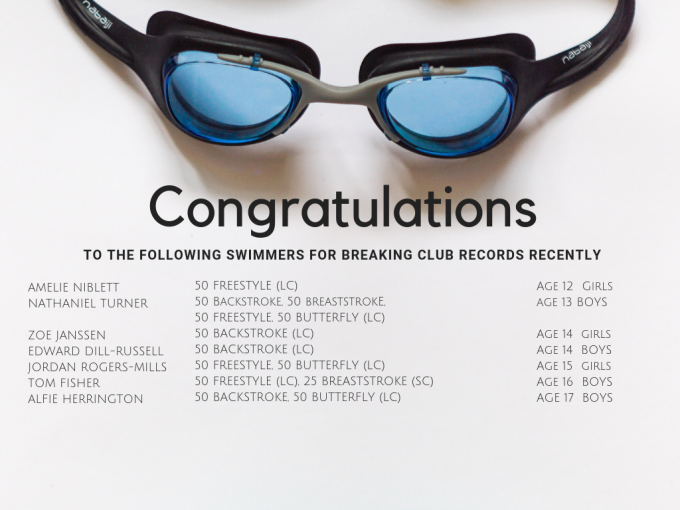 Breaking a Club Record is a great achievement for Swimmers. These can be for short course (25m pool), long course (50m pool) and Open Water swims. Short and Long Course pool record times shall be recognised by DLGC for all single Age Groups for 25m, 50m 100m and 200m in all strokes, 400m, 800m and 1500m Freestyle and 100m, 200m and 400m Individual Medley for Boys and Girls. Short course records may be made in 25m pools and long course records in 50m pools. Open Water Record times shall be recognised by DLGC for Junior and Senior age groups for 400m, 1000m, 2000m, 4000m Freestyle, 1000m Backstroke and 3 x 400m IM for males and females. All claimants must be members of Dover Life Guard Club for at least 2 weeks prior to the swim they are claiming a record for. Swimmers cannot claim a DLGC record when representing another swimming club. All pool record claims shall be ‘as age on day’. All Open Water records shall be ‘as age as on 31st December’. A record may be claimed for the first leg of relay only. All pool records shall be made in still water. Any movement of the water due to the normal operation of the filtration system shall be disregarded. All times shall be recorded in recognised competition under ASA Law or in an organised time trial under the supervision of an appropriately qualified person capable of judging stroke and with a qualified timekeeper. Records cannot be accepted from school events or other sporting bodies. It is the swimmer’s/parent’s/guardian’s responsibility to claim any record by completing the DLGC Club Records Claim Form and forwarding it to the DLGC Club Records Officer (Pool Records) or the DLGC Open Water Secretary (Open Water Records), within 28 days of the swim. The DLGC Club Records Officer/Open Water Secretary will confirm receipt of the Claim Form to the swimmer/parent/guardian within 3 days. The DLGC Club Records Officer/Open Water Secretary will check the details and if eligible will enter the record in the Club Records Book and the Club Records Database. The details will be passed to the Club Marketing Officer responsible for updating the Club Website and DLGC Social Media pages as soon as possible after the event. All those achieving a DLGC Record will be awarded with ‘A Record Breaking Achievement Award Certificate’. The award will be presented by the Swimmer’s normal coach/teacher as soon as possible after the event. The DLGC Club Records Officer will keep a list of the records broken in the year (January to December) for inclusion in the Club Celebration Night. The Club Record Claim Forms will be kept for one year in case of a query.